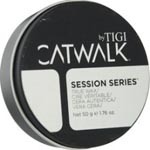 Catwalk Session Series True Wax is a medium hold wax that is pliable and controls frizz and flyaways, protects against humidity, adds luster to any style without buildup, keeps your style in place, gives you a polished texture, brilliant shine, and natural look. It has a wonderful fragrance of vanilla and sandalwood. Direction: Use on wet hair for a polished shine and control, or on dry hair to detail your style.